We are equally excited and pumped. Our Team is working hard to make you realize your dream. Do not take it insincerely and let us down. Your faith and participation has to be in sync with the amount of hard work and effort we do. Let us pledge to make it a big game changer (better than last year) in the next 60 days! 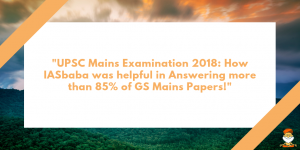 Last year, aspirants used to comment their answers in the comment box on daily basis. There were huge participation in discussion. Putting answers in comment box has been very effective to self track yourself after updating the score. In the end you can cross check your performance through disqus profile. The importance of this initiative stands time bound and aggressive reverse engineering to learn the concepts. Many of you must be busy with your own strategy but let us tell you honestly that in the last two months, it is very important to revise and consolidate your learning. Just reading won’t suffice. So, take out few hours from your schedule and make it a revision exercise. How you can make the best use of it? Be honest to your effort and do not start competing with XYZ aspirants here just for the sake of marks. It is more important for you to introspect and check your learning than focusing on others. Try to answer the questions in 20 minutes only. Many of you, almost all, asks about effective revision strategy! Can there be any? You guys study a lot and there is no issue with the hard work that has been put in. But when it comes to input-output comparison, your performance is questionable. Just do this for a Week: Go to bed before stipulated time of your sleep, at least 1 hour before. Close your eyes and try to relax your mind. You should attain full comfort and calmness. Do this on the First Day: Imagine the full story of a recent movie that you have watched. Try to recollect from starting to end. See, whether you are able to depict the clear picture or not! Now, do the same for everything you learnt from morning specially the ones you struggled with. Since it is fresh, most of the things should flow into your mind smoothly. Check what is your recollecting capacity. For example, if you prepared Polity Day 2: Topics- Try to collect all important concepts and learning of the day. Trust us, this exercise if done with sincerity will give you immense confidence as well as boost your performance. There is no ideal time for revision and there cannot be any specific date put for it, as commonly done. This will always expose your weaknesses the very same day and if you tend to forget something, can always get back to consolidate and cement it. Try to hold your nerves and learn to control the temptation. This is very important art to learn and implement! Q.1) Which of the following processes contributes maximum to the power generation in India? Q.2) The government of India had launched a very ambitious initiative of Ultra Mega Power Projects. Which of the following statements are correct about UMPPs? They are large hydel power projects to tap the full potential of unused streams. Each UMPP will have the capacity of generating 10,000 MW of power. Till now 10 UMPPs have already been sanctioned by the Government of India. Q.3) Which of the following statements are correct about National Domestic Efficient Lighting Program? It urged people to use CFLs in place of tube lights and filament bulbs. It urged people to use only 5 star efficiency rating appliances. Q.4) The rate of biomass production in an ecosystem is called productivity. Which of the following statements are correct about it? Net primary productivity (NPP) is less than Gross primary productivity (GPP). Net Primary Productivity (NPP) is the available biomass for the consumption of heterotrophs. Q.5) Which of the following statements correctly explains the process of catabolism? Seeping of water soluble organic material into lower soil horizons. Breaking up for detritus material into smaller fragments. Breaking up of larger organic molecules into smaller inorganic molecules. Use of inorganic molecules by plants to form larger organic molecules. Q.6) Which of the following factors play an important role in determining the rate of decomposition of detritus material? Q.7) Deep sea – Hydrothermal vents were recently discovered by the scientist. Which of the following statements are correct about Hydrothermal ecosystems? The organisms are not dependent on sunlight for food production. Bacteria create energy using hydrogen sulphide through the process of chemosynthesis. Only micro organisms can survive in this environment. Pyramid of number is always upright because the number of primary producers is always larger than the number of organisms dependent upon them. Pyramid of energy is always upright because at each tropic level some of the energy is lost as heat. Q.10) Which of the following statements are correct about the process of secondary succession? Secondary succession is much slower than the primary succession. Secondary succession begins in areas where natural vegetation has been destroyed. Q.11) Phosphorus is an important element used in metabolism and as a building up material in organisms. Which of the statements are correct for phosphorus cycle? Rocks are the major reservoir of phosphorus which contains phosphorus in the form of phosphates. Animals obtain phosphorus indirectly through plants. There is no respiratory release of phosphorus in atmosphere. Q.12) The benefits that people obtain from ecosystems are termed as ecosystem services. Which of the following are the types of Ecosystem services? Q.13) Lichens are one of the most important pioneer species. Which of the following statements are correct about Lichens? Lichens are not single organisms, but they are formed by symbiotic relationship between algae and Fungi. Lichens are found only in high alpine areas where moisture is scarce. Q.14) Bhopal gas tragedy has been one of the most deadliest industrial hazards in the history of India. Which of the following gas was released causing the disaster? Q.19) Other than Venezuela, which one among the following from South America is a member of OPEC? Q.20) Mahamastakabhisheka, a great religious event, is associated with and done for whom of the following? Q.21) WIMAX is related to which one of the following? Q.23) Which of the following statements is/are correct? It is a cloud computing environment which uses a mix of on-premises, private cloud and third-party, public cloud services with orchestration between the two platforms. It gives businesses greater flexibility and more data deployment options.